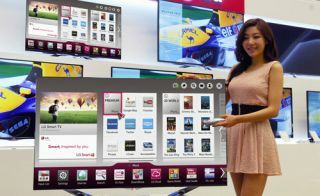 LG buys HP's WebOS for new Smart TV platform | What Hi-Fi? LG has reportedly bought HP's WebOS software to help build its next generation smart TV platform. The company will use WebOS alongside Android on a new look smart TV platform but as yet there's no word on any smartphone implementation of HP's operating software. The software was bought by HP after the demise of Palm's mobile products, the Palm Pre and TouchPad, which used the WebOS operating system. Skott Ahn, president and chief technology officer of LG Electronics Inc., told CNET: "It creates a new path for LG to offer an intuitive user experience and Internet services across a range of consumer electronics devices." LG is largely focused on the Android platform when it comes to mobile phones, and has launched the new Optimus L Series II and the full HD 1080p Optimus G Pro at MWC. But it seems it will combine Android and WebOS when it comes to its smart TV platform for future LG TVs.